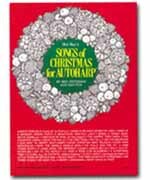 Thirty-one Christmas songs from all over the world arranged for autoharp or chromaharp. The arrangements in this book assume that the player had mastered simple strumming techniques and knows the fundamentals of autoharp playing. Many of the arrangements bring out the richness of the carols through frequent harmonic changes. Chords and lyrics are shown above the melody notes, with chords for melody playing below. Most songs in this book are arranged for a 15-chord instrument, although some require a 21 or 27-chord model. The autoharp blends in well with the spirit and harmonics of these hymns. The first section of this book is chorded for simple strumming. The second section is arranged for melody playing, with string numbers indicated. A popular collection which includes 69 songs!